(Wilsonville, OR)— Crimson Trace®, America’s leading laser sight manufacturer, began business in the backroom of a machine shop in 1994. It was a typical rainy Oregon day when founder Lew Danielson filled out and submitted the paperwork to launch the world’s premier laser sight manufacturer. In the days that followed, customers sent their GLOCK® pistols in for machining, wiring and installation of an embedded laser diode. Those laser sights continue to be serviced today—a strong commitment to the many loyal customers. 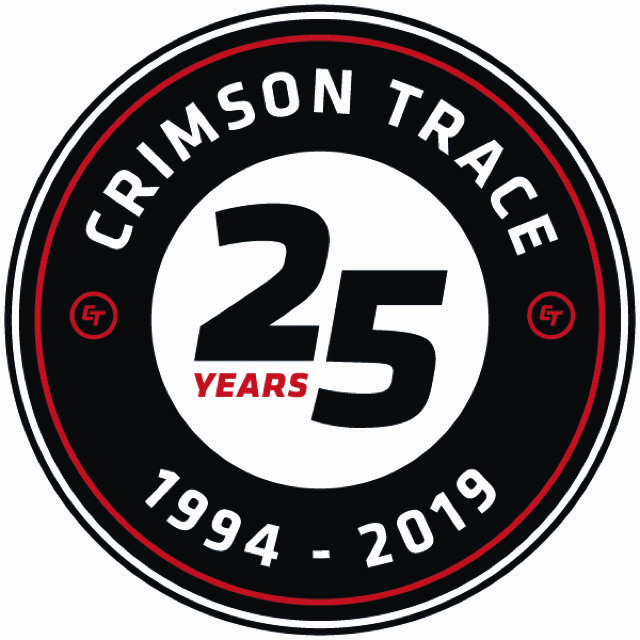 Great customer service has been a cornerstone of business for Crimson Trace across the decades and years, and in 2019 those years in business equals 25—a quarter century. In honor of 25 years of service to America’s firearms owners, in 2019 Crimson Trace is giving away numerous special firearms equipped with laser sights or tactical lights. These will be awarded each month in a special 25/25/25 drawing. Details are at www.crimsontrace.com. Crimson Trace continues to lead the laser sight accessory category by offering products through 2,500+ dealers across America. The company’s products can be easily installed without requiring modification of the firearm —or special gunsmith skills. For more information on Crimson Trace products, dealer locations, and to obtain a free copy of the company’s catalog, visit www.crimsontrace.com or call 800-442-2406.